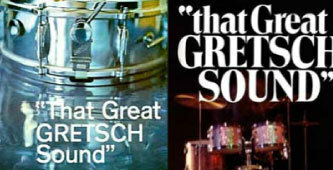 That's the sound, the anthem that began when Friedrich Gretsch, an immigrant from Mannheim Germany, founded a small shop in Brooklyn in 1883. He was to create a dynasty lasting to this day. 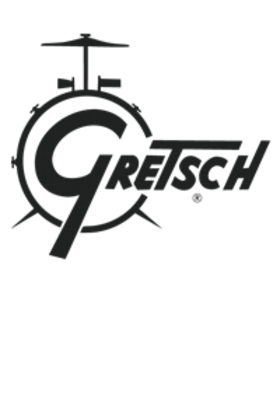 Yet Friedrich Gretsch died unexpectedly in 1895 before he could see it bloom. 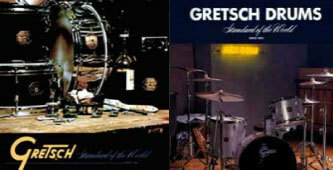 Friedrich Gretsch passed away while on a trip to his homeland leaving the company to the enterprising mind of his teeneage son still in school, still in knickers. 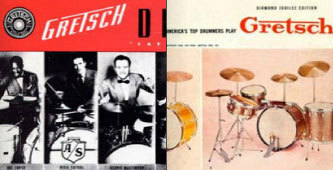 When young Fred Gretsch, Sr. entertained customers at a nearby restaurant, the waiter took the drink order but quickly advised the boy: "No matter what you order, you're going to drink milk!" 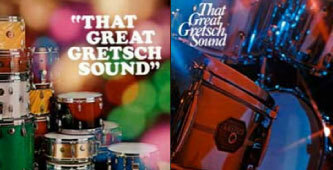 Energetic as he was enterprising, Fred Gretsch, Sr. built the business on a reputation for precision and quality. Two decades after he had assumed direction as the boy in knickers, he had moved the operation to a mammoth 10 story building at 60 Broadway in Brooklyn, where it remained until the company moved to Cincinnati, Ohio in 1972. 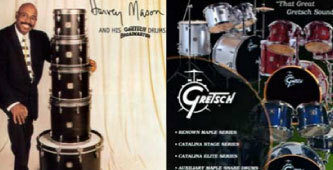 Gretsch drums are outstanding- Drums with the longest history and with the most experiences in creating an unique sound. Listen and you will hear it.